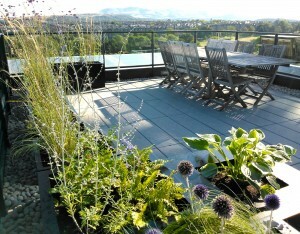 Container planting is fun, really flexible and your outdoor space can be transformed immediately. I tend to keep the planting to a single theme such as bamboo, grasses or phormiums so things don’t get too busy. And if you want a more modern architectural look, use strong colours, clean lines and an element of design in presentation. Get the right compost/soil for planting. Mix water retaining crystal with your compost for drought environments such as balconies. If your plants will be left for extended periods use a tanker irrigation system. To prevent weeds and prevent water loss, use soul coverings such as polished glass, seas pebbles and crushed granite. Be imaginative with planting and don’t be afraid to experiment. It can be done at any time of year. Large and small areas can be transformed immediately. Minimal cost and flexible but big impact. Container planting is clean and low maintenance.